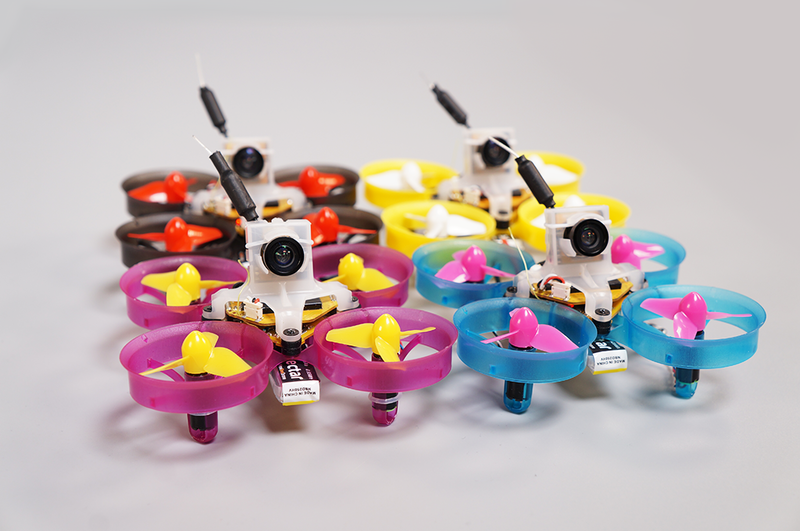 The AcroBee is a “tiny whoop”-style 1S brushed micro with features usually only found on full-size quads. 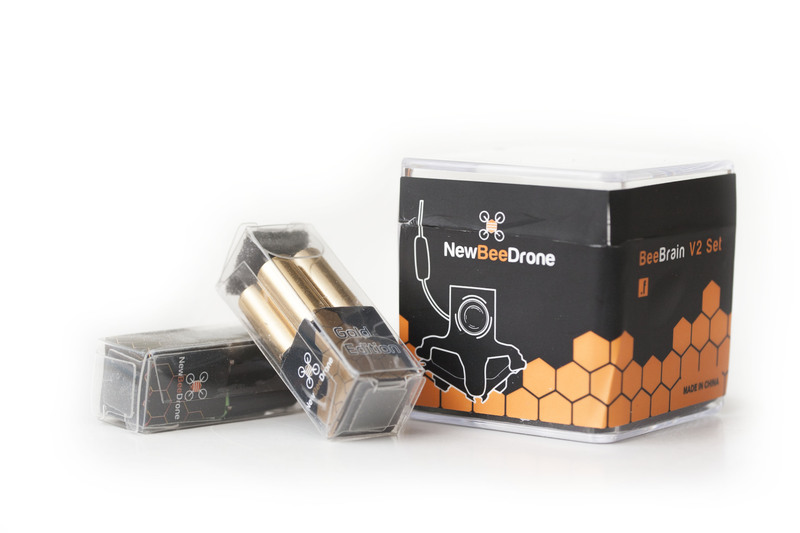 The original BeeBrain has been around for about a year, and NewBeeDrone has made some important upgrades since then that really stand out. 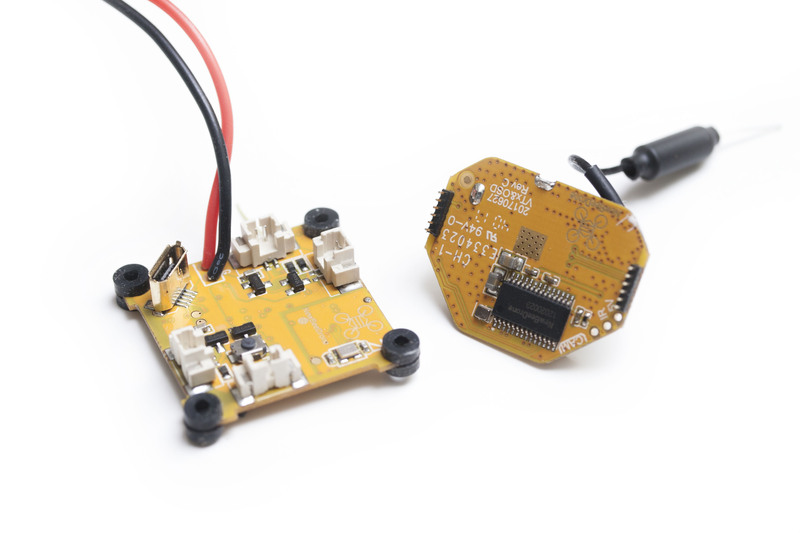 Today, we’re taking a look at the AcroBee “Full” Kit with BeeBrain V2 for FrSky, provided by NewBeeDrone. Before we dive into the review, let’s take a quick aside. 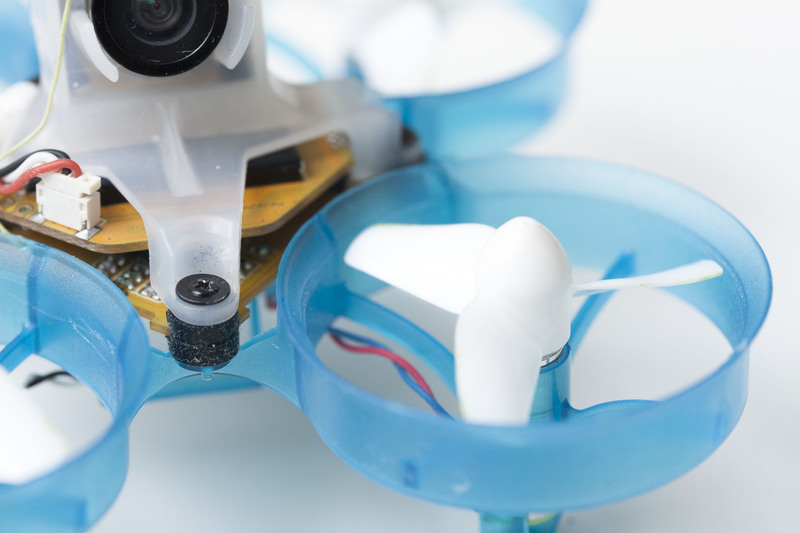 The AcroBee uses brushed motors. There are some in the hobby that now discount them because they lack the power and longevity of brushless motors. We don’t disagree that brushless is a better technology in almost every way—but there are still some very good reasons for flying this style of brushed micro quad. They’re small and fast, yet extremely light weight and well featured. They make little noise and the props are protected, so it’s hard to be afraid of them. Being approachable should not be underestimated in how it opens doors for the hobby. Groups are able to set up indoor races at many businesses precisely because they can’t hurt anything. Having only a small amount of power really is a benefit here; as you add more momentum it’s hard to keep things small, quiet, approachable, and easily controlled indoors. These are benefits you don’t get even from a 90mm 2S. Another reason to pay attention to what’s happening in the brushed micro space is that MultiGP’s smallest race class explicitly specifies brushed motors. It can certainly be discussed whether this is an appropriate restriction, but for today it’s what we have. We want to help promote racing as a community event, and part of that is inter-chapter competition. That’s only really possible with common race class specifications. Whether or not we like everything about a class spec, we’ll promote the things that bring people together before we push people to do something that divides the hobby further. As of this writing, there are very few options for brushless micro quads in this same power class. 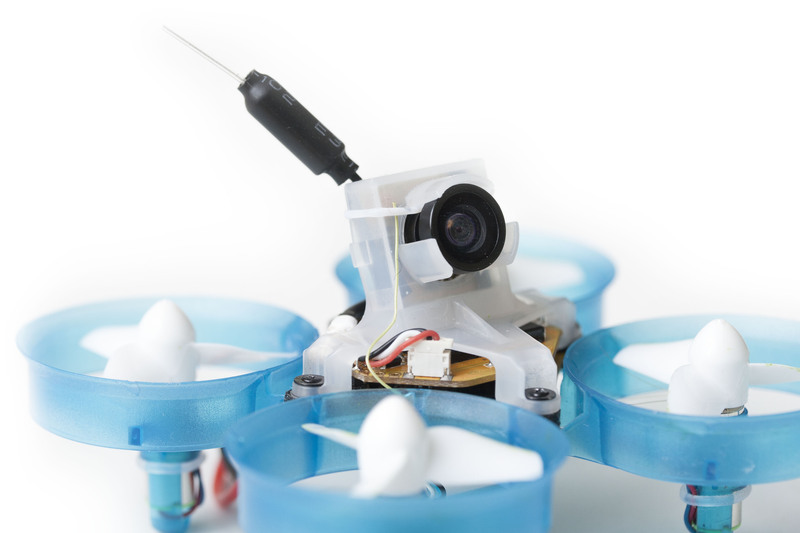 We’d love to see more products with extremely small brushless motors that are at home with 31mm props. The option to choose a frame color just became available with recent restocking. There’s pink, blue, black, and yellow in addition to the original white. Prop colors can be pink, white, yellow, or red. You can select your frame color, but the props you get from NBD are a random color. Each other option builds on this Basic kit. 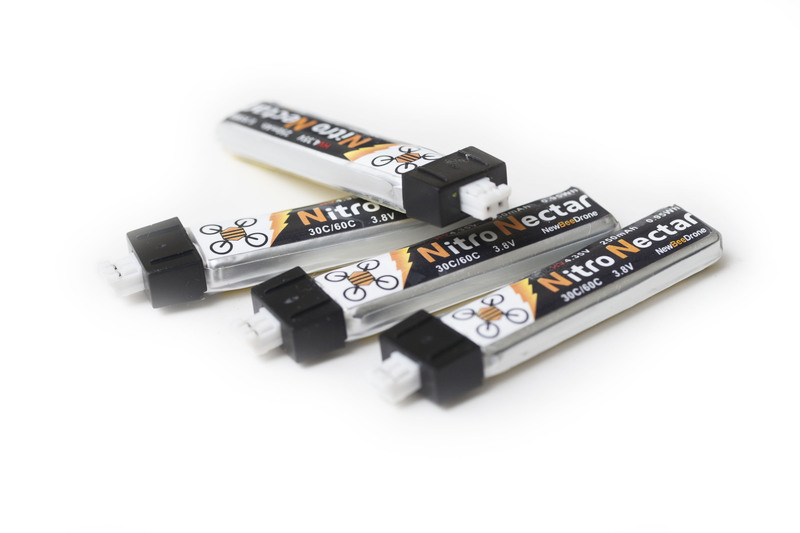 All of the upgraded kits include 4 batteries and NewBeeDrone’s own parallel charge board. The Full Kit adds one set each of NewBeeDrone’s alternate motor choices and is probably the one of most interest to the user who already has a full-size racer and is looking to add an indoor setup. Other kits mix in a radio, goggles, and a battery charger at different price points which give users starting fresh an easy way to get started. The Cockroach frame is very durable and has a lot of nice touches in its design: stress relief, component mounting points, and wire pinch protection are a few of the highlights. The cockroach frame is really well made. For such a simple product, I can see where a lot of thought has gone in. It’s reinforced in areas that tend to break on the Inductrix. There are pegs in the inside of each motor rest to prevent the wires from getting pinched. The sides offer a place for a rubber band to wrap around (though it isn’t needed with the BeeBrain). Stress points are generally rounded, which distributes force better and prevents breakage. It’s very well suited for the BeeBrain FC. While it isn’t obvious which way should be the front, NewBeeDrone clears that up quickly with their assembly guide. 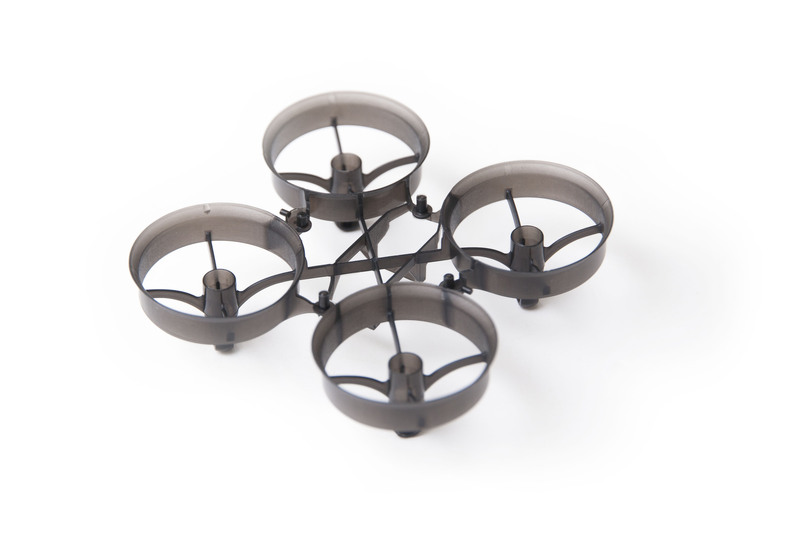 With the AcroBee, you get almost all the benefits of a full-size quad! The F3 board allows it to run at 8kHz gyro and looptime with enough CPU left over for its other features like the OSD, even with dynamic filtering turned on. PIDs and rates are completely customizable along with most everything else typically available inside Betaflight. The loaded version was an Oct 9, 2017 release of 3.2.1—almost current, but updating could still bring a few bug fixes. Updated firmware files can be found from the FC’s product page. You might think it’s overkill to use an F3 on such a tiny machine, but size doesn’t really matter when it comes to the amount of work the flight controller has to do. 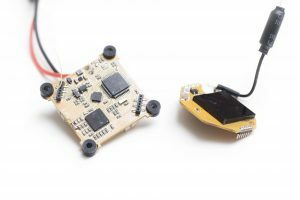 The F3 is also more future-proof since Betaflight has announced the end of support for F1 boards. The JST-PH 2.0 power lead comes soldered in place. Various kit parts are nicely packed. They’re each available for individual purchase. The board box is good for storing some of the really tiny spare parts. This board uses 30A MOSFETs. The MOSFET is a simple electric switch that takes the place of an ESC—a complex speed controller isn’t needed with a brushed motor. 30A ought to be plenty, even for the power-hungry Gold motors. You’ll find an extremely small external antenna coming off the board. This is actually in addition to an antenna right on the board itself, and you can select which one you’d like to use via a solder jumper. The feature list mentions a transponder driver, but I didn’t find any mention of it in the manual nor could I find pads on the board that would be usable for this. I doubt many will be disappointed as IR isn’t really the best approach for timing micro quads. Props fit extremely snug; I actually broke one trying to press it onto the shaft when my finger slipped off the hub. It would have been very difficult to get back off without a prop removal tool that I had from an old Hubsan. This is the first micro I have that didn’t come with a prop removal tool, but also the first one where I’m actually glad I had it; it’s tough to remove a prop from the hub because of the frame ducts. I expect the props will take a lot of wear before they come off. This is great; my other micros eject props every time they bump into anything at all. The included props are KingKong tri-blade. The tri-blades appear to have the same pitch as the stock Inductrix quad-bladed props. Since the props are enclosed in the frame, the 10 pairs you get should last a very long time. In all of my testing, I never broke a prop in a crash. The radio receiver is built into the board, so there’s only FrSky and Spektrum to pick from. FlySky and other users are out of luck here since the board won’t take an external receiver. On our FrSky version, telemetry is reported back to the radio—I got a bunch of flight data including battery voltage. This uses the older FrSky protocol, not SmartPort. That’s not a big deal for telemetry data but it means the Betaflight LUA script won’t work. You can’t configure your VTx, PIDs, and rates from the controller alone—you must use Betaflight Configurator or the OSD menus. The tiny yellow wire sticking up near the camera is a receiver antenna. It measures just 0.3mm wide. NewBeeDrone recommends tucking it into a rubber band like this. Changing channels on tiny VTx units are almost always a huge pain. The dip switches, buttons, and displays are tiny and not especially useful. The AcroBee, which uses BetaFlight OSD to set your video transmission channel, does not have this problem. I showed up at a group of five people already flying and asked about getting a channel. It took no time at all to power on and flip to what was available, then change again to help spacing later on, and one more time afterward because it was easier than re-configuring the lap timer. One downside is the channel and power can’t be changed before powering on. You’ll have to wait until everyone is clear before turning on and then making the adjustment. Since the only practical way to change your video is to use the OSD, you have to get on your channel before you change it. If you don’t know it, it could lead to a long hunt. You could actually lock yourself out if you manage to change to a channel your goggles don’t support. If this happens to you, see the setup section below for a fix. The camera is good quality. It doesn’t have a lot of definition in extremely dark conditions, but it does stop upping the gain before the frame fills entirely with noise, which really helps. The dynamic range can’t compete with an HS1177 or a newer CMOS of that size; you can easily get into situations with large blown-out highlights if there’s sunlight in the area. The camera does adapt reasonably quickly to changing conditions. If you’re cruising this will be more than enough; if you’re racing hard you might want to avoid courses with drastic light changes. Thankfully, it’s generally easy to remedy this when you fly indoors. The integrated camera mount has about 20° of non-adjustable uptilt. I found this angle to be just right. The wide-angle lens works well for indoor cruising flight as well as flying at much sharper angles outdoors. Any lower angle would just add more props to the view, and a higher one would make it tough to fly inside. VTx power is switchable between 25mW and 1mW. The 25mw setting is typical of this size and will get you through a wall or two, sometimes beyond. Signal can vary quite a bit with reflections and multipathing; the concept of Fresnel zones kind of goes out the window when you’re indoors. I don’t really notice a big difference with the AcroBee’s linear antenna (vs. the common cloverleaf on other micros) when I’m indoors; probably because double-reflections happen more easily and cancel out the primary benefit of circular polarization. The 1mW setting is surprisingly usable indoors and might allow you to easily get a whole bunch of quads in the air at once. You might have some trouble flying through adjoining rooms, but if you’re flying mostly within line of sight it’s worth giving it a try. Unfortunately, that also restricts its usability as a “pit mode”. I would not attempt to use it that way and risk knocking other pilots out. Many of the supporting parts are extremely small. The kit is supplied with four 250mAh LiHV batteries, which will take a charge up to 4.35V. You’ll need a charger that can handle them, though. Many standard chargers actually can’t do single-cell batteries, and only newer chargers can do LiHV. Even though the SkyRC D100 can charge LiPo at 1S, and can charge LiHV, I was surprised to find that the option wasn’t available when it was switched to LiHV mode. I picked up one of the new 6× LiHV chargers to try out as well. I found that charging to 4.35V (vs. 4.20V) doesn’t seem to give too much additional power, but does increase flight times somewhat. The longevity of 4.35V batteries has been called into question, but we can’t yet say if that’s a problem here. NewBeeDrone’s parallel board is nicely designed. It’s a double-sided board with differently-sized charge ports on both sides, but foam covers each side thick enough that the connectors never touch the ground. 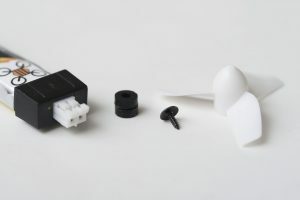 One side has the 1.25mm Micro JST connector, the other is the 2mm JST-PH connector. While the board terminates with an XT60 connector, there’s an adapter included to change that to a pair of 4mm banana plugs that fit most chargers. Being 1S simplifies the parallel charging process a little since, but you’ll still need to follow a safe parallel charging process. Each channel on the board is individually fused, but the fuses aren’t replaceable. The travel case is a cardboard box with a foam insert. It’s on the upper end of quality as far as cardboard boxes go, but it’s not going to last too long if subjected to the elements or any significant stress. The foam fits the frame nicely and provides storage for 12 batteries. NBD alludes to the case being a repurposed shipping box, and for that I applaud them. If you’re not expecting hard-core protection, it should work as a nice way to keep your frame from getting crushed. Four motors plug into one connector each. The power lead is routed through a small hole in the frame, which keeps it from getting pinched. The bind button is located under a strut, so you can push on the strut instead of finding something to stick down into the frame. A full and comprehensive setup manual can be found on NewBeeDrone’s website. 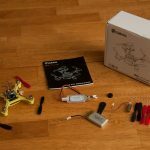 It’s well written and includes binding instructions as well as how to get Betaflight running, board flashing, and the ports/receiver settings you’ll need. It also includes other suggested settings like PIDs, rates, and flight modes. The manual was written before the recent change in how to download Betaflight Configurator, so check out our article if you’re having trouble getting it. 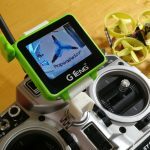 NewBeeDrone also published a few setup videos on YouTube that are even simpler to follow than the manual for assembling the kit, binding your radio (FrSky, Spektrum,) and setting up Betaflight. There are other videos on their channel that go on into a number of other, deeper topics, too. How easy is setup? The kit showed up at my door at 10am on a Saturday morning as a box of unconnected parts. I was flying the AcroBee at a Maker Space open house at 1pm that afternoon—and I had time for some household chores before I left. This extremely quick setup can largely be credited to the videos linked above; I highly recommend them. They are short and to the point, but still comprehensive and included several build tips that I might not have thought of on my own. There’s no soldering involved. It’s still a really small product, though, so you do have to be careful. The screws don’t want to stay seated in the hole until you start tightening them down, are easy to drop and lose. You’ll need a very small screwdriver; I used a Philips #0. The receiver antenna feels like it could break if you look at it wrong—it measures just 0.3mm wide! I felt like any small mistake during the build might turn out to be expensive. Take extra care not to pinch any wires or over-tighten screws during assembly. Binding was simple. I liked that there was no need to hold the bind button at power up. It was great to be able to power on first and then use both hands to press the button. This could present a risk that the bind process is invoked during flight, but it seems unlikely: motor holders prevent most access to the button and it requires more than a quick tap to invoke bind mode. 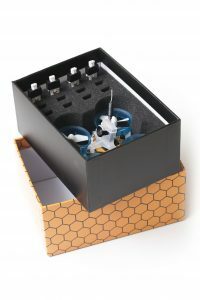 The BeeBrain uses rubber grommets for soft mounting, and the Cockroach frame uses curved supports to help distribute stress in a crash. The Betaflight setup is aided in large part by intelligent default settings built right into the target definition. Since NewBeeDrone has a strong understanding of the craft you’re going to build on their flight controller, they’ve pre-configured settings like PIDs, rates, the onboard VTx control, voltage monitoring, and even the default battery capacity. Being part of the target definition means there will be less time spent re-configuring settings when you update Betaflight. My AcroBee came preset to transmit on Raceband 8 at 1mW. If you have a limited receiver, such as an early 7-channel Fat Shark goggle, you won’t be able to see your video or access the OSD to change it. Connect to Betaflight Configurator, open the CLI, and type set vtx_band = 4, then set vtx_channel = 1, then save. That will put you on Fat Shark 1, 5740mHz, when you reboot. One final change you might want to make in the setup is the maximum cell voltage in the ‘power’ panel. The default value is too low for 4.35V batteries, so plugging one in confuses Betaflight. The voltage will blink for the entire flight and the battery graph won’t work. Go ahead and raise this—you don’t need to find a value that works for multiple cell counts since you’ll only ever be using 1S batteries. If you’ve never flown a whoop-size micro in FPV, it’s really different from anything you’ve flown before—including slightly larger 1S quads like the QX90C. Almost anything can be a gate: a chair, a window, someone’s legs, even the rafters in most semi-industrial spaces. A whole new set of flight locations becomes available to you which the FAA can never take away! I live in a very small space, and it isn’t difficult to set up a course worth flying. But it’s also a different kind of flight: slower, tighter, more like cruising. Many pilots use horizon mode even if they are full-rate pilots outdoors. LiHV Nitro Nectar batteries operate up to at 4.35V and use the larger JST-PH connector. You’ll get 4 in a kit. If your charger isn’t compatible, the usual 4.20V charge will work but give you a reduction in power. Flying the Silver motors indoors is a great experience. I felt the stock rates were just a bit too twitchy and needed a bit more expo, but that’s always down to personal preference. Once adjusted, it was really easy to do some indoor cruising. I blew through small openings that I previously struggled with on the QX90C. The Silver motors are efficient, too: I got roughly 50% more flight time vs. the Gold motors even though I was flying about the same speed! I tried the Silver motors outdoors and it was a disappointing experience. There’s a good reason NewBeeDrone doesn’t recommend them for this. The wind easily blew me off course and I had trouble just flying a few simple patterns. The Gold motors offer a definite power increase. Indoors, it’s enough to make gap-hitting more difficult. You’ll use a much narrower band of throttle, so it’s harder to establish a consistent hover. If these are the only set of motors you have, you’ll fly okay indoors, but it isn’t the set I’d recommend for it. Outdoors is a whole other story! The wind still kicks you around quite a bit, but there’s enough power available to counteract it in most cases. Acro flight with flips and rolls is well within reach. The difference between indoor and outdoor performance can be explained by two different factors. First, the top-end thrust is much higher. You barely ever hit this indoors, but it’s easy to get there outside. Second, the motors seem to take a short time to ramp up to maximum acceleration. Indoors you’re only accelerating for extremely short time periods, meaning you don’t get the full benefit of what the motors can do. Outdoors, opening up for several seconds is fairly normal and the quad really takes off. I was doubtful, but with the Gold motors NewBeeDrone actually succeeded in making the 31mm micro fun to fly outside. It is worth reiterating the flight time/efficiency difference from the Silver motors; pushing the quad hard outside is sure to exacerbate that issue. The Black motors sit between the other two. Experienced pilots will feel right at home on the Black motors, even indoors. So little time is spent at full throttle indoors that I’m not convinced it will actually give you better lap times on a tight Whoop circuit. It’s a nice upgrade that some pilots will appreciate—but it’s more a matter of preference than a whole different flight experience. The included tri-blade props make very little noise but provide plenty of power. I found the tri-blades to be noticeably more responsive than a standard Inductrix quad-blade. As thrust increases (particularly with the Gold motors) you may get better performance with the quads. I preferred the tri-blades because they helped improve indoor handling and I doubt I’ll fly the AcroBee too much outdoors. 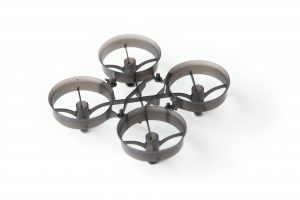 NewBeeDrone only sells tri-blades, but you can get quad-blades on Amazon and from other retailers. If you decide to fly outdoors, take care where you fly. The AcroBee will be one of the easiest quads to lose. It will easily get stuck in a tree, get blown around by the wind, or flip over on a roof. Tall grass will simply eat it. With neither bright LEDs nor a beeper, it does little to help you find it if you crash. You might be in for a very difficult search or retrieval. There’s a clip for your VTx antenna to fit into, but the recommended build includes a rubber band around it. A small bit of tape protects the camera board. I had some problems with a radio signal dropouts. The RSSI triggers a warning quite often, and a few times RX loss downed the quad. It didn’t happen often, but it’s obvious the link isn’t as good as on most other receivers. If the small wire hanging off the board is all active antenna, then bending and tucking it might not really be best for performance. Setting up failsafe to hold for a fraction of a second before cutting the power might be a useful change as well. There’s a real peace-of-mind advantage to having voltage sensing delivered to the OSD. Other micros often don’t provide any kind of low voltage indicator that’s visible through FPV, which can easily lead to over-discharging batteries if you’re not careful. With the AcroBee you can see what’s left in real-time instead of relying on a timer. Another advantage here is that indoor flight is far less spasmodic than outdoor, so the reading is more reliable than what you might be used to on a full-size racer and doesn’t bounce around much at all. 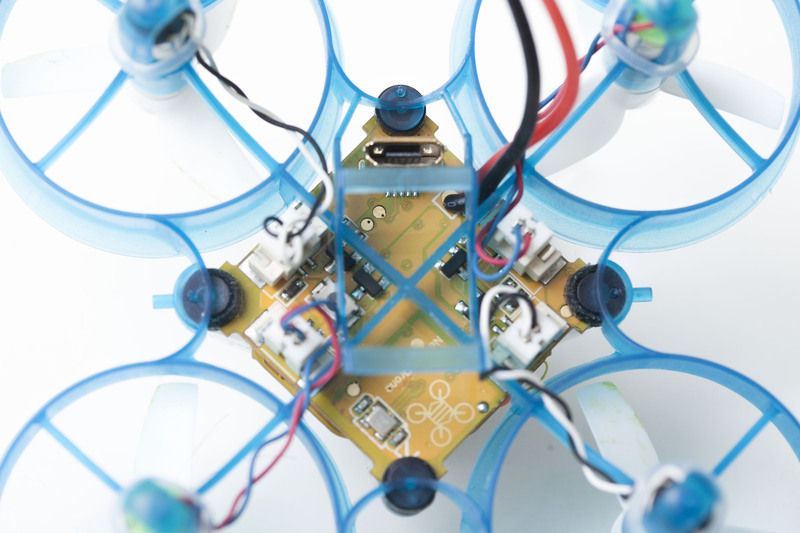 The AcroBee is really well thought out and doesn’t require any modification to perform at its peak. You’re essentially already flying a fully upgraded model—the AcroBee is a collection of parts all designed as upgrades for the Inductrix and can still be used that way. Simply choose your motors based on the flight experience you want to have. Because the AcroBee is a kit, it’s not surprising that everything is available individually. Repairs should be pretty straightforward since no soldering is involved. The official AcroBee case is a repurposed cardboard box, but the custom-cut foam does a decent job keeping it protected in travel. If you plan to change out motors, it might be worth it to pick up extra frames. The motors press fit very snugly into the frame, and it’s easier to transfer the board to a new frame than it is to swap motors in and out of one. There cost to do this is pretty minimal. If you’re really itching for an upgrade, though, NewBeeDrone has an even faster set of motors available: Unicorn Edition. These beasts are spec’d at a staggering 25,500 KV. The AcroBee and BeeBrain V2 is definitely the most impressive 1S micro that I’ve flown to date. It’s easy to assemble, easy to set up, and provides a great flight experience. It’s very durable, easy to work with, and motor selections offer a choice of power to fit differing tastes. There is so little to complain about here: mainly the potential to lock yourself out of the video, (easily avoided,) the inability to use the Betaflight LUA script, (merely inconvenient,) and the occasional RX loss, (an actual problem, but one that can be mitigated). If NewBeeDrone could have somehow provided a way to change the video channel before powering up the VTx and gotten anti-turtle mode in, this would be just about the perfect micro build—but many full-size quads that can’t do those two tricks, either. You’ll pay more for the AcroBee than an Inductrix, and pay well above the many Inductrix clones, but the quality can easily be seen throughout each component. I think the price is justified by the value. Another benefit of the AcroBee is that you’re supporting a U.S. company: NewBeeDrone is located in (and ships from) San Diego, California. The AcroBee can’t put out the power that 2S micros can, but I think that’s actually a big part of its draw—I’d argue the reason to own one of these at all is precisely because it’s fairly tame. Having a 65mm-class micro on hand greatly improves your ability to get stick time. Bad weather? Stuck in a tiny hotel room? FAA giving you trouble? No problem. The AcroBee enables flight just about anywhere. Groups exist that fly races with these inside businesses like sports bars and breweries—try that with a larger quad and I doubt you’ll get very far. Most importantly, and despite the lower power, flying the AcroBee is a lot of fun. But if you really want to do some micro gap-hitting outdoors, NewBeeDrone’s got you covered with the Gold motors as well. I would absolutely recommend the AcroBee for many pilots. It’s great for keeping up your skill and getting stick time while stuck indoors. It’s an awesome trainer for someone getting into the hobby before moving to anything larger or without prop guards. 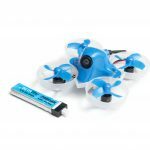 And if you’re lucky enough to have a whoop league nearby, this little machine has the stability and performance to bring home some big wins. 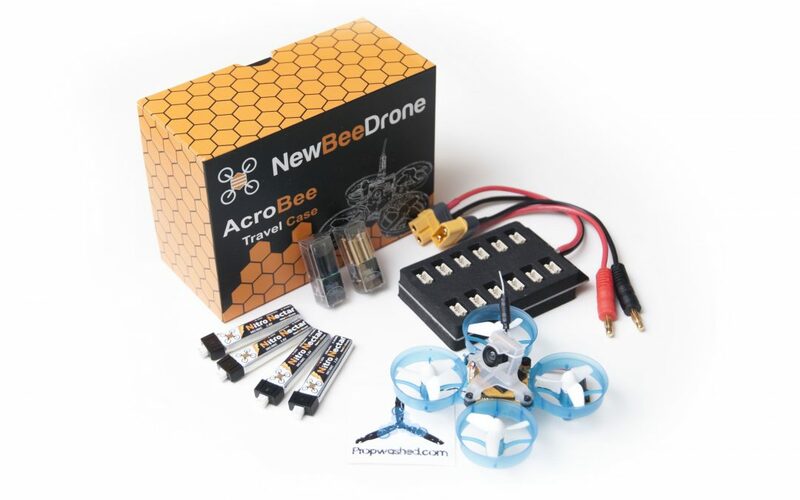 Buy the AcroBee V2 full kit at NewBeeDrone! If you love your AcroBee, NewBeeDrone would love you to join the others who do and share a photo on their gallery!